50% off all Haymarket Books for the holidays! Greetings. Your piece on George H.W. 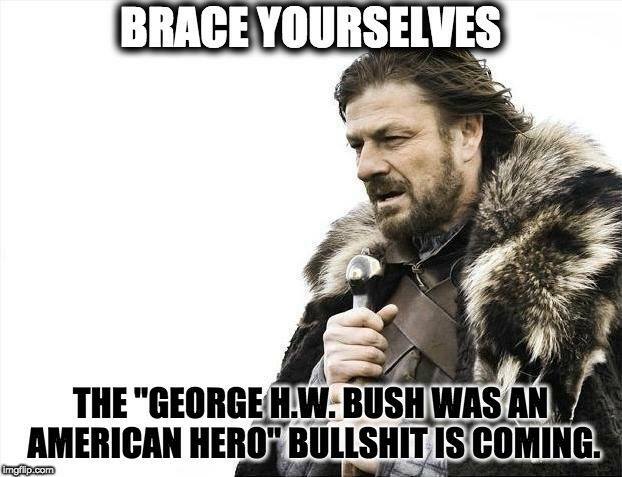 Bush was good, but you omitted a couple of things. 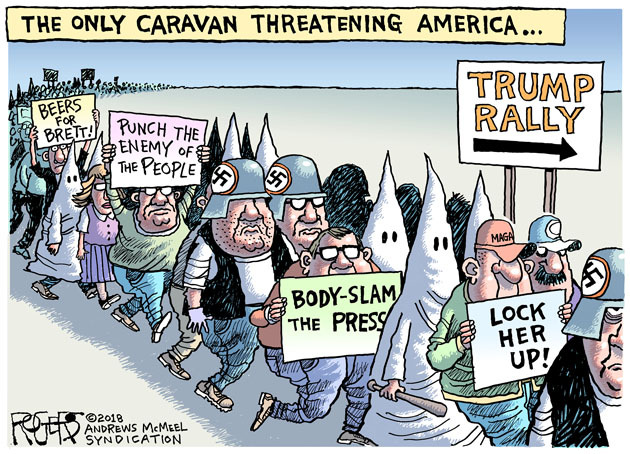 One is the invasion of Panama. The official U.S. body count was, I think, less than 100, but some observers put it as high as one or two thousand. In any event, some Panamanian victims were bulldozed into mass, unmarked graves, and it seems the neighborhood of El Chorillo was specifically targeted because its residents were poor and working-class supporters of Panamanian strongman Manuel Noriega. El Chorillo was of no military consequence, and as such its targeting constituted a war crime. The justification of the attack on Panama was that Noriega was involved in drug trafficking, but this doesn't stand up. The U.S. itself was involved in drug trafficking, perhaps in cahoots with Noriega himself. This was done to fund the contra war in Nicaragua, as was revealed in the heroic reporting of Gary Webb of the San Jose Mercury News. So, what was the real reason for the invasion of Panama, which killed many Panamanian civilians? It is known that at least one high-level Bush aide - I believe it was Forest Gregg (sp?) - met with Noriega sometime before the invasion, presumably to talk about Panamanian cooperation with the war on Nicaragua - a cooperation that Noriega eventually ended. This is pure speculation, but I think Bush invaded Panama because Noriega had evidence of Bush involvement in drug trafficking and or illegal involvement in the contra war on Nicaragua. It's important to remember that the Iran-contra scandal led to indictment and conviction of high-level Reagan administration officials, and for a while it looked like that crisis might even bring down the Reagan presidency - in other words it was very serious stuff. There's also the question of Bush's possible involvement in an alleged agreement between the 1980 Reagan campaign and the government of Iran to hold Iran's 52 U.S. hostages until after the 1980 election, presumably in exchange for the arms that were in fact sent to Iran, a presumed mortal enemy of the U.S., after Reagan took office. During the 1980 campaign, polls showed that Jimmy Carter would have won the election if the hostages had been released. According to Reagan campaign official Barbara Honegger, in the fall of 1980, right in the final, post-Labor Day run-up to the general election, Republican vice-presidential nominee George Bush made no campaign appearances for four days. Needless to say, this is unheard of, and speculation is that Bush went to Europe to meet with Iranians to work on the deal. This interesting. By no means was I privy to the information mentioned here. However in the circles of intelligence a lot of this was being passed around. Not sure why I am so enthralled with this stuff.? Inappropriate to trash the dead. Far more inappropriate to sit back and let a false heroic narrative be created about a historical figure. That's how the facts get twisted and how the mistakes of history become ignored and thus repeated later, all in the name of arbitrarily-imposed mourning periods. Not trashing, just keeping reality alive. Don't leave out banking (S&L) fraud, money laundering. To his credit, he was a much better actor than Reagan. Everybody is elevating a warmongering racist. He was in Dallas when JFK was assassinated. He doesn't deserve a tribute; what he needed was a trial for war crimes at the Hague. And exactly what was he doing with JFK. Two things left out of this summary...first is that Bush Sr. was possibly the only American who didn't remember where he was when Kennedy was killed...(yes, it turned out to be Dallas)...the second is that he is believed to have met with Iranians in Paris where they agreed to continue holding the US hostages until after Reagan was elected. The October Surprise. “When a political leader dies, it is irresponsible in the extreme to demand that only praise be permitted but not criticisms,” it leads to “false history and a propagandistic whitewashing of bad acts.” The inconvenient truth is that the presidency of George Herbert Walker Bush had far more in common with the recognizably belligerent, corrupt and right-wing Republican figures who came after him — his son George W. and the current orange-faced incumbent — than much of the political and media classes might have you believe. Lots of praises coming from the "liberal" media. Re: Class Prejudice and the Democrats’ Blue Wave? It is an easy dead end to glibly dismiss Trump voters as racist, which also implies stupid, and turn our backs on them., I think it would be better to listen to everyone and to concentrate on those districts that were "Obama-Trump” districts because they went for Obama in 2012 and Trump in 2016." It's very complicated, but not hopeless, especially if there are real benefits like Medicare for All and free college. It was not mentioned that the votes from 5 counties in the Mississippi Delta, the poorest most African American areas were not counted. Nor was it mentioned that the polling places are mostly in white areas where African Americans rightly feel unsafe. This information was gleaned from 2 Mississippi colleagues, one white, one African American. Democracy? Now, the billionaire GOP donor has pivoted to influence the future of the Democratic Party. Records show Bacon is one of several deep-pocketed donors that have shifted to financing recent Democratic campaigns. Though national media attention has focused largely on newly elected democratic socialists and progressive members, the House Democratic caucus has also swelled with pro-business moderates, such as the Blue Dogs, the Problem Solvers Caucus, and the New Democrats. This is why 100 million voters stayed home in 2016! We see how staying home worked out. Elections are the beginning...now the task is to hold these folks, including my own congressman, accountable for advancing a progressive agenda. Hold Town Halls, phone calls, meetings, picketing. Keep up the pressure and let them know what we want. Republicans in all but name. Corporate Dems, Are funded by the same forces that fund the GOP. Just because they have a D by their name. That doesn't mean they're going to help ANY workers. EVERY DINO MUST BE PRIMARIED!!! Don't be ridiculous. if it were that simple then by now the tax code should be three words. 30% for everyone... done. The minimum wage in Nassau county is 11$ per hour! That’s insane! Where I live is called the “Gold Coast”! Gold for some but not for most ! Disgusting and disgraceful! And what can you really do? There is plenty you can do. If you are willing to go up against big corporations. It's so discouraging when the Premier of Ontario says right away there's nothing he can do! How about (step one) support the union in their struggle to keep the plant open? The U.S. government interfered in Latin American countries’ governments, installing regimes favorable to U.S. corporations. The governments were de facto corrupt. Then they abrogated their responsibilities to their citizens so their societies degenerated into lawless gang extortion and violence. Yes. We did this. The income gap has been steadily widening along with the erosion of democracy. Those who love the power that the present system gives them will loudly scream “socialism” or “communism” and we are supposed to recall the terror of Russian oligarchy dictatorship as proof that caring for the less advantaged is the road to ruin. The power-loving ones that have been steadily working to turn us against one another are very worried about people uniting to support each other. They want us jealous and suspicious and ready to commit mayhem in search of the crumbs thrown by the powerful. Thus they have turned “socialism” and “communism” into four letter words and worked diligently on our fears. How much longer are we going to give them the satisfaction of controlling us? Lately watching the National Geographic channel- I am (of all things) identifying with Peruvian or Thai drug enforcement officers- why? Indicating meth and orange hair! trump clearly an addict to deception and greed! The Jorge Chavez airport in Lima. Weapons, a back pack, wrapped in plastic! I want to join the authorities coordinating! As law enforcement U N does not do! trump has ingested balloons that may kill him! "if a man is heterosexual and he wants to be in a relationship with a woman, it’s not that easy to get a woman by providing her economic security she doesn’t have, or buying her something that she needs. He has to be kind, thoughtful, attractive in other ways. And it turns out that when men have to be “interesting” in order to attract women, they are. They actually end up being better men. It’s not that difficult a concept. I don’t know why people are so shocked by this. " "One of the most positive features of state socialism, Ghodsee argues, is that it gave women economic independence from men. In the former Soviet countries, women may not have been able to take part in free elections or find a diversity of consumer goods, but they were guaranteed public education, jobs, housing, health care, maternity leave, child allowances, child care, and more. Not only did this arrangement liberate women *and men alike* from the anxieties and pressures of sink-or-swim capitalism; it also meant that women were much less likely to rely on male partners for the fulfillment of basic needs. This in turn meant that* heterosexual women’s romantic relationships with men were more optional, less constrained by economic considerations, and often more egalitarian. * As Ghodsee writes in her book:"
When women enjoy their own sources of income, and the state... Read the rest here. Read "In Woman's Defense," by Mary Inman, published in 1941 as a collection of articles in the CPUSA's West Coast paper, and later in book form. She touches on all these arguments in a way that set off quite a controversy within the CP that echoed for years. This article by Nassar is both disingenuous and dishonest. It is disingenuous because the phrase has in fact always meant exactly what Nassar denies--the total elimination of Israel and its Jewish population (sometimes with an insignificant exemption for Jews who lived there before 1917). Not only Hamas, but also the PA leadership have frequently declared that they will not allow Jews in their Palestinian state. As for Nassar's pseudo history, it was the Arab High Command that declared in 1948 that they would "drive the Jews into the sea" and perpetrate a historic massacre--that was what "from the river to the sea" meant then and it still means that. This attempt to whitewash the genocidal intent behind the phrase is beneath contempt and any leftists who buy into this are as deluded or self deluded as their predecessors who believed that Stalin's Soviet Union was a worker's paradise. Portside covers both the domestic stories of importance to the organizing of the working peoples but also the international side. Too many leftists have been intimidated by the war on terrorism, accepting it as necessary, and backed away from supporting self determination and the national liberation struggles across the globe as though the US has the right to determine who is capitalists to support versus terrorists. It is time we rise up again to support the movement for liberation and stop letting people like Trump and Pence speak for us. Thanks for the your continued excellent and provocative reporting. Much of the Left still subscribes to the view that fascism is primarily a product of the manipulations of capital or big business. There are several things wrong with this view. It ignores the political culture of fascism and fails to explain how and why fascist movements attract a mass following. It embodies a crude instrumental ism that conflates the financing of fascist movements by sections of business with the dynamics of fascism itself. It also views fascism in overtly pathological terms, as abnormality, thus breaking the more interesting and challenging links between fascism and 'normality'. Finally, it contains a catastrophist vision: it sees fascism as a kind of cataclysm, like some volcanic eruption or earthquake, a seismic shift in the political landscape. So far as the situation in India is concerned, this has surely demonstrated that that is not how fascism grows. In India the growth of fascism has been a gradual, step by step process where the fascist elements penetrate all sectors of society and emerge having built up that groundwork. So, if we in India have anything to contribute to a theory of fascism, part of the contribution lies in disproving the catastrophist element. This still leaves the other two perspectives, which I called 'instrumentalist' and 'pathological' respectively. Both are dangerously wrong and part of the reason why the left has failed to establish a culture of successful political resistance to fascism. Now in contrast to the 'official' view, there is another group of theories of fascism which also emanated from the left, although a more disorganized left, a left outside the Comintern, driven out of Germany by Nazism, and not collectively represented by any school. I have in mind two rather brilliant analyses that were developed in the 1930s against the background of German fascism; one by Wilhelm Reich who was a practicing psychoanalyst. In his clinical work in Berlin in the early thirties, Reich would have come across literally hundreds of active supporters of Nazism. He was a committed socialist who fled Germany when it became impossible to live there, and died, ironically, in a US jail in 1957. Give a young person or her teacher Joelito’s Big Decision/ La Gran Decisión de Joelito Written by Ann Berlak, illustrated by Daniel Comecho. 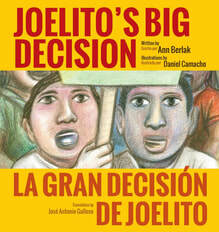 Beautifully illustrated and translated Spanish/English bilingual Joelito’s Big Decision/ La gran decisión de Joelito tells the story of a boy, a burger, a friendship and the struggle for a living wage. Timely & timeless Decision (Hardball press, ages 6-15). Let young people know that the fight for a just wage continues. 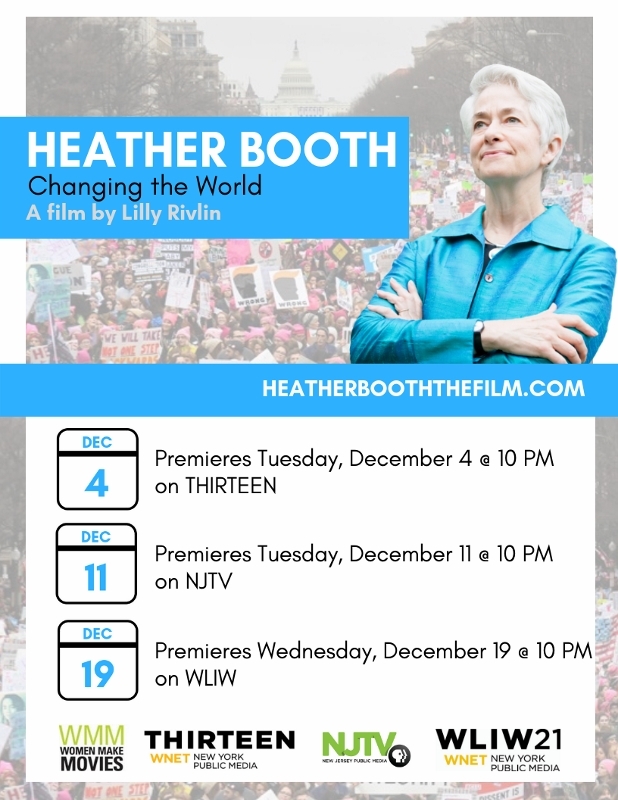 Through telling the story of 50 years of life in the movement, this film inspires people to organize. Civil Rights, Women's Movement, Immigration Reform, elections, training for progressive organizing are part of what is covered. It has been shown around the country and people are inspired by it to take action. At a recent screening one person said, "I came in thinking there was nothing we could do, and I leave ready to take Action, Resist and Organize!" Today, the Trump Administration held a signing ceremony with Mexico and Canada for a supposedly “new” version of the North American Free Trade Agreement (NAFTA). But this retread NAFTA fails on jobs, wages, human rights, the environment and public health. It also has big giveaways for the oil and pharmaceutical industry that make it even easier for them to abuse people, our communities, and the environment. Mark your calendars for our NAFTA 2.0 Fix it or Nix it webinar on December 13 at 5pm (PT). This webinar is an important opportunity to provide our movement with information about the impact that NAFTA has had and how Trump's NAFTA could continue to harm working people and the environment in all three countries. It will also provide grassroots activists with tools to contact their member of congress and get involved in the fight against Trump's pro-corporate NAFTA. Ted Lewis has led Global Exchange's work for peace, democracy, and human rights in Mexico since the dawn of the NAFTA era in 1994. Throughout that time he has written, spoken-out, and organized resistance to North American trade policies that undermine labor rights, displace people, disrupt communities, and devastate the environment. Ted's analysis been published widely and he is cited frequently in print, radio, television and online media. Join us on December 13 and help us make sure that Trump does not get to impose this bad deal on the whole continent. Next week is the deadline to apply to join the one week trip to study mental health care in Cuba, sponsored by Medical Education Cooperation With Cuba (MEDICC). This trip is February 24 to March 3, and approximate cost is $3800 including travel to Florida airport. The trip consists of 4 days in Cienfuegos, Cuba, 1 day in Santa Clara and 2 days in Havana. In 1995, Cuba instituted an integrated structure to improve its mental health services. With 17 psychiatric hospitals and 101 mental health centers, Cuba has produced a unique, community-based approach to preventing and treating mental health issues. Join MEDICC to explore the country’s health system, focusing on the development and priorities of the mental health program. Travelers will participate in a full-time schedule of activities, and will have many opportunities to get to know Cubans in the settings where they live and work. Participants will spend 4 nights at the Hotel Jagua in Cienfuegos and 3 at the Hotel Presidente in Havana. This trip will host 15-20 participants. If interested, please contact MEDICC to request a traveler registration form. Travel logistics and visas will be arranged by Marazul, a travel agency specialized in Cuba travel. The total cost of the program will depend on the number or participants and program structure, and is currently estimated at $3,400-$4,100 per person depending on single or double occupancy. Marazul will inform participants of the final costs and send an invoice 4-6 weeks before departure. MEDICC and Marazul will make visa arrangements for all participants.